We won’t follow that rabbit hole today, but we will work from a generally accepted assumption that our thoughts define our reality and that we can take control of this reality and make adjustments to it that can enhance our quality of life. Mindfulness-based cognitive therapy is one tool that can help us learn to recognize and understand our thought and feeling patterns, with the goal of creating new, more effective patterns. Mindfulness-based cognitive therapy (MBCT) is a type of therapy born from the union of cognitive therapy and meditative principles. Cognitive therapy aims to help clients grow and find relief from symptoms of mental illness through the modification of dysfunctional thinking (Beck Institute, 2016). Mindfulness can be summed up as the practice and state of being aware of our thoughts, feelings, and emotions on a continuous basis (Greater Good Science Center, 2017). Mindfulness also contributes to an acceptance of the self as it is, without attaching value judgments to our thoughts. The marriage of these ideas is MBCT, a powerful therapeutic tool that can be successfully applied to depression, anxiety, bipolar disorder, and more. For a closer look at MBCT, see one of the founders of the technique describe how MBCT can be applied to depression. Two experiments testing the effectiveness of MBCT on depression produced encouraging results regarding relapse rates (Kuyken et al., 2008; Teasdale et al., 2000), while more recent studies have shown the applicability of MBCT to a variety of ailments, include anxiety, depression, and ADHD in clients from multiple age groups (Haydicky, Carly, Wiener, & Ducharme, 2015; Kishita, Takei, & Stewart, 2016; Schroevers, Tovote, Snippe, & Fleer, 2016). MBCT has also been approved by the UK National Institute of Clinical Excellence as an effective treatment for depression relapse (MBCT.com). Compared to other staples of clinical psychology MBCT is still relatively new, but overall the evidence discovered through clinical research shows that it is effective in many populations. MBCT is thought to be effective for many clients, but it has been found to be especially effective for one group in particular: people who have suffered from multiple episodes of depression (Mental Health Foundation). The official jury is still out, so to speak, on the effectiveness of MBCT for individuals with less chronic depression and those who suffer from other mental ailments, but the preliminary evidence is encouraging (see sources above). Mindfulness helps the client discover their own thought and mood patterns. Mindfulness helps the client learn how to be present and appreciate the small pleasures of everyday life. Mindfulness teaches the client how to stop the downward spiral that can emerge from a bad mood or thinking about painful memories. Mindfulness allows the client to “shift gears” from their present state of mind to one which is more aware, more balanced, and less judgmental. Mindfulness gives the client access to another approach to dealing with difficult emotions and moods (MBCT.com). It will help you discover what makes you vulnerable to downward mood spirals, and why you get stuck at the bottom of the spiral. It will help you see the connection between downward spirals: High standards that oppress us or feelings that we are simply “not good enough”, ways we put pressure on ourselves or make ourselves miserable with overwork and ways we lose touch with what makes life worth living. For more information on how MBCT can be applied to help treat mental ailments, see the next section on the techniques and exercises that are used most often. As we’ve written about before, there are a lot of exercises to cope with mental illness and stress based on mindfulness. In addition to exercises like mindful seeing, acceptance, and mountain meditation, there are many techniques specifically for MBCT. The most popular course of MBCT treatment was developed by Jon Kabat-Zinn. This treatment is an 8-week group-based therapy program created to help clients cope with both mental and physical symptoms (Good Therapy, 2016). Groups meet once a week for two hours and complete homework outside of class for six days a week. Homework includes meditation practice, audio-guided mindfulness exercises, and techniques like the three-minute breathing space (Good Therapy, 2016). The first minute is spent on answering the question, “how am I doing right now?” while focusing on the feelings, thoughts, and sensations that arise and trying to give these words and phrases. The last minute is used for an expansion of attention from solely focusing on the breath, to feeling physical sensations and how they affect the rest of the body. For a guided version of the three-minute breathing space, watch this video. Other recommended MBCT techniques are discussed below. The Body Scan exercise begins with the participants lying on their backs with their palms facing up and their feet falling slightly apart. This exercise can also be done by participants sitting on a comfortable chair with their feet resting on the floor. The facilitator asks the participants to lie very still for the duration of the exercise, and move deliberately and with awareness if it becomes necessary to adjust their position. Next, the facilitator begins guiding participants through the Body Scan. Participants begin by bringing awareness to the breath, noticing the rhythm, and the experience of breathing in and expelling out. The facilitator explains that participants should not try to change the way they are breathing, just hold gentle awareness on the breath. The facilitator guides attention to the body next: how it feels, the texture of clothing against the skin, the contours of the surface on which the body is resting, the temperature of the body and the environment. Participants are instructed to bring their awareness to the parts of the body that are tingling, sore, or feeling particularly heavy or light. The facilitator asks the participants to note any areas of their body where they don’t feel any sensations at all or, conversely, areas that are hypersensitive. After the Body Scan is complete, participants are instructed to bring awareness back to the room when they are ready. It is recommended that participants open their eyes slowly and move naturally to a comfortable sitting position. Mindfulness can be practiced in many situations throughout the day, including exercise. However, rushing straight to the exercise can be a missed opportunity to prepare both mind and body for physical exertion. It’s a natural and instinctive movement for humans. Regular stretching improves flexibility and range of motion. Stretching improves and increases circulation by bringing a rush of oxygen to the muscles. It feels good to stretch! Mindful stretching adds even more benefits, such as increased awareness and a sense of balance. You have several options to choose from if you would like to practice mindful stretching, a few of which are listed below. Pandiculation is a fancy term for a fairly simple stretch. To try this stretch, put your palms on your shoulders (or as close to your shoulders as you can get), raise your elbows up to shoulder height, open your mouth, and let out a big, satisfying yawn (Crain). (4) stretch carefully to avoid affecting other muscles or joints (Berg, 2011). You can repeat steps three through six up to six times, depending on what is right for you at the time (Berg, 2011). Gomukhasana: This pose involves opening the chest through the extension of the triceps and shoulders, and is typically performed while kneeling or sitting with crossed legs. Side to side neck stretch: This stretch is performed by sitting and gently using your hand to pull your head to one side at a time. Pigeon Pose: This pose is a fairly complicated pose, with your hips to the floor and one leg in front of you, perpendicular to the mat, and the other leg straight out behind you. For more information on correctly executing this pose, see the detailed explanation here. The Scorpion: To practice this pose, lie flat with your arms straight out to the side. Next, lift your right foot as high as you can with the sole straight up to the ceiling. Finally, lift your right hip and reach your right foot over to the outside of your left leg, while keeping your chest and arms on the floor. Switch legs to experience both stretches (Crain). Whatever technique you use, mindful stretching can be an excellent addition to MBCT. Sometimes the most simple exercises can be the most helpful. In the case of MBCT, this is especially true. Practicing mindfulness throughout the day is the best way to make sure it is woven into your life. This exercise is an easy one for beginners. While showering, direct your attention to the temperature of the water as it hits your body, the feel of the spray, the smell of the shampoo, and the sensation of lathered soap against your skin. If your mind begins to wander, a common problem during showers, gently bring it back to the present with thoughts about what you are seeing, hearing, smelling, and feeling. Similar to mindful showering, bring your awareness to the sensations evoked by the feel of the brush. Ask yourself how the bristles feel against your teeth, your gums, and your tongue. Focus on the taste of the toothpaste to keep yourself in the present moment. As mentioned earlier, we have covered mindful eating before. One helpful tip that has not yet been mentioned is to turn off any distractions, like the computer, TV, radio, and smartphone, and allowing all of your senses to focus on. Try this mindfulness exercise when you have only a few dishes to wash. Watch as you scrape or sponge the dirty dishes. Notice the textures, sights, and sounds of washing dishes. You can even focus your attention on the smell, although the desirability of this move is up for debate. Instead of making your bed quickly and carelessly, put effort into making the bed. Move deliberately and with purpose. Pay attention to what you are seeing and doing. Notice the way the sheets slip across the bed and the way the pillows look underneath the cover. Feel the different textures of the bedding, and above all, try to immerse yourself in your current task, as mundane as it may seem. As covered earlier, mindful exercising is a great way to incorporate mindfulness into a healthy lifestyle. Turn off the TV and music and bid farewell to friends and family for a few moments. Focus your awareness on how your muscles feel, how you are moving, and the changing rate of your breath. Give yourself a full experience of exercising without the distractions from the pain or heavy breathing that we often find ourselves trapped with. Taking the opportunity to practice mindfulness whenever one is presented will help you to maintain a healthy sense of awareness and balance throughout your day. For more exercises and techniques to apply to your practice, check out this Preliminary Client Handout for MBCT for tons of useful information and “homework assignments”. This link also features over two dozen guided meditations and talks from MBCT teachers. If you’re interested in diving more deeply into MBCT, continue on to the next section where we describe MBCT courses, training, and certificate programs. MBCT is still a relatively new treatment, but it has grown quickly in popularity. There are numerous courses, trainings for MBCT teachers, and programs for certification in MBCT available for mental health and social service professionals who want to incorporate MBCT into their work. There are many classes based on the MBCT program offered in many different locations. For anyone living near Oxford in the UK who is interested in learning about MBCT, a course is held at the Oxford Mindfulness Centre. This course is conducted in groups of 25 participants. It lasts eight weeks and meets for two hours per week plus six hours on one Saturday. The Oxford Mindfulness Center also offers a course that meets for five to six hours every two weeks. This course also caps participants at 25 per group and is offered to all adults. If you are not located near Oxford, there are other courses around the country and the world. 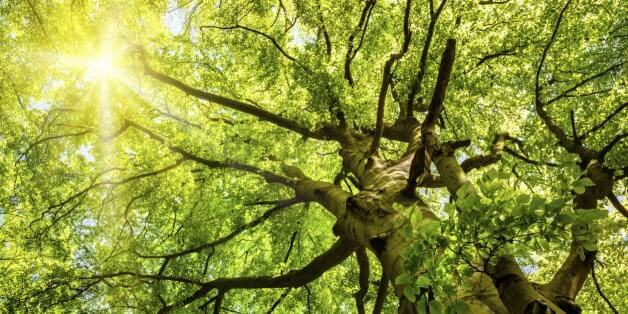 The Brighton Buddhist Centre in the UK also hosts a mindfulness course based on MBCT for anyone who experiences depression or anxiety, as well as courses on mindfulness-based stress reduction and mindfulness for living with pain and illness. The Atlanta Mindfulness Institute holds an eight-week MBCT class for up to 10 people at a time. This course also includes a six-hour “retreat” day on a weekend day during the eight-week run. Finally, the University of California, San Diego (UCSD) Center for Mindfulness offers public programs for those wishing to learn how to apply MBCT to their own lives, including a course for youth, a course on self-compassion, a 5-day program designed to help participants learn to cope with life’s challenges, and a resilience training course for first responders. (1) teacher qualification, (2) teacher certification, and (3) post-certification recommendations. This phase begins with individuals who wish to become MBCT teachers completing the prerequisites for the 5-day MBCT teacher training course, then attending the course itself. Next, teachers complete the MindfulNoggin online course and apply for “Teacher in Training” status. Finally, future teachers must complete a minimum of 20 hours of mentorship while teaching two 8-week MBCT courses, then apply for teacher qualification status. Phase 2 begins when teacher qualifications have been granted (step 6 in phase 1). 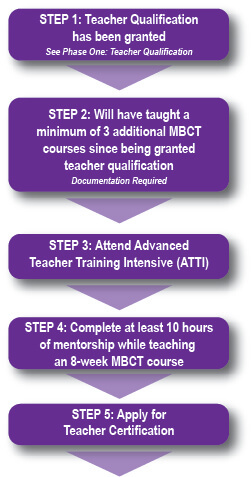 Future MBCT teachers must teach at least 3 additional MBCT courses since qualification to advance to the next step: attending the Advanced Teacher Training Intensive (ATTI). Finally, teachers can provide evidence of completion of at least 10 hours of mentorship while teaching one of the 8-week courses. When teachers have finished all of these steps, they can apply for teacher certification. Like most worthwhile learning opportunities in life, the learning does not stop at the end of the course or program. Teachers are encouraged to continue attending mindfulness meditation retreats, engaging with peers, soliciting feedback from experienced MBCT teachers, and engaging in further training to develop their skills. It is imperative that teachers continue their professional development so they can keep up with the new ideas and techniques in MBCT and ensure they are offering their clients the best treatment that is available. In addition to the UCSD Center for Mindfulness pathway, similar training can be found at the Oxford Mindfulness Centre, the Mindful Academy in Spain, and several universities and other institutions in the UK. The website MBCT.com also hosts plenty of information on training and courses for those wishing to practice MBCT as clients or with clients. For example, the Mindful Mood Balance for Mental Health Professionals introduces participants to the basics of MBCT in an online format. This course is also the first step towards the MBCT Teacher Certification. Another MBCT training course is offered at the Centre for Mindfulness Studies in Toronto, Canada. This course is part of the Applied Mindfulness-Based Cognitive Therapy (MBCT) certificate program, which is offered in addition to an Applied Mindfulness-Based Stress Reduction (MBSR) program. These programs hold the distinction of providing instruction from one of the founders of MBCT, Zindel Segal. The Centre for Mindfulness Studies also offers courses designed specifically for healthcare professionals and educators, and hosts courses designed for professional development rather than obtaining a certificate. There is no shortage of teacher training in MBCT. The only difficult part is choosing which training program to attend! If you’d rather read about MBCT yourself or start out with a good introduction to MBCT, check out the Mindfulness-Based Cognitive Therapy Implementation Resources. This PDF [MBCT Implementation Resources] is a great resource for learning about and setting up your own MBCT practice. This section provides a general outline and highlights some of the most informative and helpful parts of the document. If you want a more detailed look at this excellent resource, click the link above to open the PDF and read it at your convenience. Research needs to be translated and accessible to clients. Ownership of the research or implementation process is critical. People who are enthusiastic about the practice are vital for promoting it. Conduct an analysis of context to ensure you can be fully prepared to meet the challenges that will arise. Ensure credibility by providing credible evidence and figures. Provide leadership at each level to give strategic support and authority. Provide adequate support/resources (including financial, human, and equipment). Develop opportunities for integration into clients’ daily lives. there is a chapter on setting up an MBCT service with information ranging from criteria for inclusion and exclusion to an assessment of participants to post-class follow-up tasks for teachers. The last section in this chapter covers the risks that both participants and teachers face when meeting for MBCT (including emotional intensity, a possibility of trauma, conflict in the group, and challenges from participants), and provides some great advice for working around these risks. Another chapter covers how to conduct MBCT reunions for course “graduates,” with information on different formats, an example invitation, and a sample session plan. Next, the manual covers the important topic of training and supervision for MBCT teachers. This chapter provides guidelines on best practices, reading materials for teachers and trainers, and required qualities and qualifications for teachers and trainers of MBCT. Another great chapter focuses on why evaluating the outcomes of MBCT courses is important and how to engage in a proper evaluation. Taking a good look at what went right, what went wrong, and how to incorporate more of the good and less of the bad can drastically improve outcomes for both participants and teachers. Finally, this manual provides a list of further resources that anyone who wants to teach MBCT should read. If you are interested in learning more about setting up your own MBCT practice, click the link above to open the PDF and find the additional resources listed at the end. Retreats are great opportunities to mingle with colleagues, learn new skills, and keep up to date on any changes in your field. There are many retreats offered that both clients and practitioners of MBCT can take advantage of in order to further their personal or professional practice. Retreats for clients allow them to continue practicing the techniques learned in MBCT, while retreats for teachers provide an opportunity for personal development, professional development, or both. If you’re in the Bay Area and interested about attending an MBCT retreat, follow this link for information on classes, workshops, online courses, and retreats for the practice of MBCT. There are several more opportunities to attend MBCT retreats for teachers and trainers of MBCT. Silent retreats are very common locales for mindfulness-based gatherings. In fact, some consider them essential for learning the skills required to successfully teach MBCT. Silence facilitates successful meditation practice by removing distractions from the environment, giving attendees the opportunity to glean the maximum amount of practice and knowledge possible. For a more detailed list of silent retreat locations, follow this link. The Centre for Mindfulness Studies in Toronto also offers an intensive training and retreat for students in their Core MBCT Facilitation Certificate Program. This retreat runs for five days, eight hours a day, and is open to all healthcare professionals and social service workers with a clinical background and a mindfulness and/or meditation practice; however, they must have completed the eight-week MBCT program and formal training in mindfulness. This retreat combines the peace and calm of a silent meditation retreat with the interaction and learning of a clinical training workshop. Participants of this retreat should expect some stretches of silent meditation and other periods of active discussion with retreat leaders and fellow attendees. For more information on MBCT and mindfulness retreats in the Toronto, CA area, check out this link. The Insight Meditation Society also offered an Insight Meditation Retreat for MBSR and MBCT professionals, although it is unclear whether this offering has continued over the past few years. This retreat was conducted over 8 days and intended to extend and deepen practitioners’ mindfulness and meditation experiences. It is conducted mostly in silence, but the schedule includes time for sustained mindfulness practice, daily talks, meditation instructions, and interviews with the leaders. Lying down meditation, yoga, and group discussions are also offered during the retreat to help teachers integrate their practice into their own lives. I hope this article will prove to be a valuable resource for anyone interested in MBCT techniques or teaching. Mindfulness-Based Cognitive Therapy has shown promise as a viable treatment for depression, anxiety, and other mental disorders, and comes with very few and very minor side effects or risks. If you are interested in participating or adding MBCT to your clinical practice, please take a few minutes to browse through these links. Teachers and trainers especially could benefit from going through the Mindfulness-Based Cognitive Therapy Implementation Resources PDF. What do you think of Mindfulness-Based Cognitive Therapy? 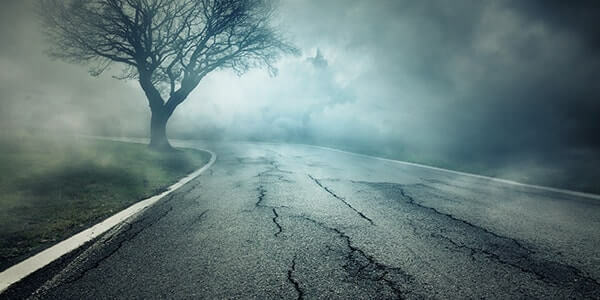 Is it the wave of the future or a passing trend in clinical psychology? Would you give it a try yourself to help cope with life’s challenges, or try it out with your clients? Let us know in the comments section. Berg, K. (2011). Prescriptive Stretching. Champaign, IL, US: Human Kinetics. Hi! Dont forget to mention Bangor University jn Wales, where MBCT was started!! They have an excellent teacher training. I have ADHD and this article really helps. I also tried this as a Link, I am getting better now. That’s so great to hear, Ava! I hope you continue to have success with these techniques. Not very many states have retreats for Mindfulness based cognitive teachings. Only 3 listed that I came across. Thank you so much for this very thorough MBCT resource. I am a psychologist in Kansas City who is trained to deliver MBCT to clients through UCSD’s Center for Mindfulness and I have found the course and its practices to be quite beneficial to participants and teacher alike! I will include a link to my MBCT page that has some additional resources.